WWF reckons that Kinabatangan floodplain is one of the only two places on earth where one can watch 10 primate species at a single place. Kinabatangan river, with a length of 560km, is the longest river in Sabah. It stretches, from the interior of Sabah all the way to its river mouth which opens out to the Celebes sea. The river runs eastward most of the time. The floodplain of Kinabatagan, the largest in Malaysia, is a refuge to the many wildlife in Sabah, as most parts of Kinabatangan forests have been converted to palm oil plantations. These small corridor of riverine forests are all but the only place left for the wildlife to move around. WWF, a conservation organisation, reckons this is one of the two places on earth where one can watch 10 primate species at a single place, some of these animals like Proboscis monkey and the Borneo Pygmy Elephants are endemic to the Borneo Island. Lonely planet guide book even mentions that Kinabatangan area is Malaysia's gift to the world for its wildlife and nature. This is of no surprise that in 1920 the Johnson family from Kansas, USA came to Kinabatangan, North Borneo (now Sabah), to document and film the wildlife and native people. The Lok Kawi Wildlife Park covers about 280 acres of land, and at the moment 60 acres of the land have been utilized for the wildlife park and the botanical garden. The park has more than 100 species of mammals including birds, which are kept in captivity. Animals like the Bornean Pygmy Elephants, Orangutans, Proboscis Monkey, Borneo's Rhino and Sun bear, which are native to Sabah, they are the main attraction here. 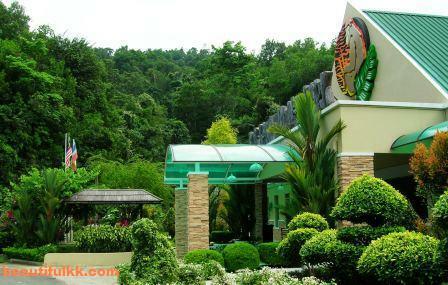 The park is jointly developed and managed by the Sabah Wildlife and the Forestry Department. Located about 25km away from Kota Kinabalu City, the Lok Kawi Wildlife Park can be easily accessible by either the old Penampang-Papar road via Donggongon town or the Putatan-Papar road. Bornean Pygmy Elephant is the world's smallest elephant. DNA anlaysis showed that Borneo's elephants were isolated about 300,000 years ago from their cousins on mainland Asia. Since then, the elephants become smaller with relatively large ears, longer tails and straight tusks. 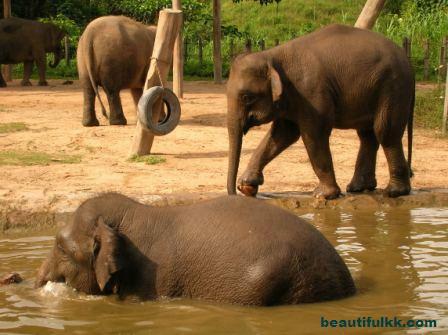 Bornean Pygmy Elephants are also known to be rather tame and mild-tempered compared to others Asian elephants.